It would be nice to tell you that the incredible depths, lack of sunlight and intense humidity ruined the quality of the following photos. But, unfortunately that's just not the case. This dusty first generation Toyota Tercel was found during some parking garage spelunking and looks as if it hasn't seen the sun in quite a while. Maybe the other cars made fun of this Tercel's awkward rear end and gracelessly protruding bumpers causing this one to hide underground away from their jeers. A more likely scenario is that the owner of this fairly well kept example is hiding it from the road salt during the winter months to keep that rust from getting any worse. The Tercel was Toyota's first front driver and featured an oddball longitudinally mounted drivetrain. Its boring-as-oats 1.5 liter SOHC four churned out 60 horsepower which is slow by today's standards... and 1980's standards. But so long as the rust tumors can be kept at bay, it should run for a very long time. 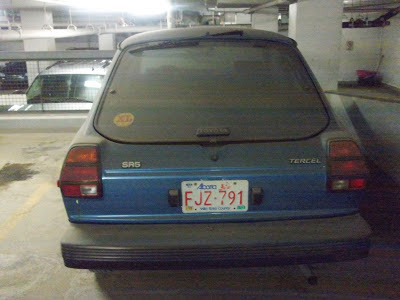 Rust aside, it's in fairly decent shape and while the later versions of the Tercel are still quite common, these earlier cars are rarely seen on the roads. But being an 80's four cylinder Toyota means that ending this cars hibernation is only a battery charge away.